One of the more beautiful parables of the New Testament is that of the Prodigal Son,which incorporates into what is a story in miniature of the fall and redemption of man — his alienation from the Heavenly Father and his return to the Father’s “house,” after a life of dissolution and the squandering of his spiritual inheritance — an image of love that cannot be read without bringing spiritual tears to the innermost recesses of the soul. There is no Christian who does not feel the munificence of God in the simple retelling of the story of the son who returns to his Father in disgrace, yet is received with honor, affection,and extravagant love and is recompensed for betrayal and perfidy with all of the signs of honor that his father can bestow upon him. This enduring parable is fragrant with the Christian message of redemption,redolent with the aroma of love,and spiced by the pungence of forgiveness and Grace: the Father restoring “to the Prodigal the tokens of his proper glory..., mystically...[rendering him]...glad on high” (from the stichera of Saturday Vespers to “Lord I have cried,” Sunday of the Prodigal Son). 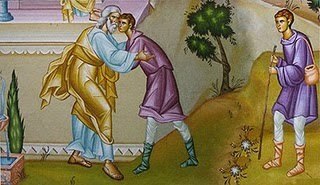 As St. Augustine, in his Confessions, movingly expresses it, we behold in this story the forgiveness of “a kind God,” Who gave much to the Prodigal Son before his fall, yet Who “was kinder still when he returned destitute” (Book I,§18). A kind father — as the Divine Chrysostomos summarizes the tale — gives a wayward son “greater honors” than those shown to an older brother, who had remained with the father and “who had not fallen,” thereby underscoring the “greatness of repentance” (“Letter to Theodore,”I,§7). "...outwardly the elder son was faultless. But when he confronted his father’s joy at the return of his younger brother, a dark power erupts in him and boils to the surface. Suddenly, there becomes glaringly visible a resentful, proud, unkind, selfish person, one that had remained deeply hidden” (p. 71). What Father Nouwen did not directly acknowledge in his book — an issue which we discussed in our later correspondence — was the Patristic foundation of his insight. He was, of course, wholly aware of the Patristic tradition surrounding the image of the elder brother in the parable of the Prodigal Son (he was well-read in the Fathers in general and, of course, in the Fathers of the Desert, to whom he often turned for inspiration in his several battles with severe depression). However, his theological formation did not, despite his brilliance, lead him to a deep understanding of the centrality of the consensio Patrum in his hermeneutical pursuits. As a result of this circumstance, a number of Orthodox observers, insufficiently familiar with that consensus themselves, have too hastily dismissed Nouwen’s book — admittedly almost wholly bereft of Patristic citations — as an innovation. This is not at all true, and it is unfortunate that Nouwen’s approach to Biblical interpretation and spiritual imagery inadvertently led to this accusation. He was, in fact, following a Patristic tradition, in his popular and often insightful book, that dates to the early Church. The well-known Church writer Tertullian saw in the image of the elder brother the Jews who envied the Christians for their “reconciliation” with “God the Father,” thus winning for the New Israel the promise originally made to the “Chosen People” (“De pudicitia” [On Modesty], chap. 8). Similarly, St. Ambrose of Milan, in his Exposition on the Holy Gospel According to St. Luke, which contains this parable, speaks of the envy of the elder brother for the wayward son, also drawing a parallel between the former and the Jews (Book VII, §§239-243) — a parallel, as an aside, that is not, as many wrongly imagine, an anti-Semitic slur. Following a slightly different interpretive tradition, the Blessed Bishop Nikolai of Ochrid, though he identifies the Prodigal Son with the worldly man and the older brother with the spiritual man, also asserts that the latter serves as a lesson to us not to be “puffed up in our own righteousness and, in our pride, scorn repentant sinners” (Homilies [Birmingham, 1996], Homily 10, “Sunday of the Prodigal Son”). This is precisely the imagery employed by St. Gregory Palamas, as well, who mentions the elder son’s anger, suggests that this anger manifests itself because the son is “ignorant of the riches of God’s goodness,” and points out that, just as the father receives his wayward son, so he “pleads with the elder one, teaching him what is fitting” (Homily 3, “The Parable of the Lord on The Prodigal Who Was Saved,” §§22-23). Blessed Theophylact, Archbishop of Ochrid and Bulgaria, says of the elder son — whom he also identifies with the Pharisees — , that he does not understand the “outpouring of God’s compassion.” Theophylact does not, like some of the earlier Patristic commentators and like the foregoing Roman Catholic writer, directly accuse the faithful son of envy, but of a spiritual blindness and of “grumbling,” in the manner of the Pharisees, at seeing repentant sinners so freely and lovingly received. Acknowledging the variety of interpretative images attributed to the two sons, he asserts that the younger son represents the sinner who turns from iniquity and the older one the righteous who stand sorely “vexed” before the ineffable “judgments of God.” He argues that the parable was meant for the Pharisees and the self-righteous, to warn them against their weaknesses. In the gentle quality of his rebuke, he stands at one end of the spectrum of Patristic admonitions against the elder sibling in the parable of the Prodigal Son. And it is in his balmy counsel, perhaps, that he is able to bring together the extremes in imagery employed by the Fathers in drawing our attention to the dual message of the story: that of the glad reception of the repentant sinner in the abode of the Father — whatever the actual reason for his final return — and that of the spiritual harm that can befall those who fall to envy, to anger, or to resentment of the loving action of the Father. In every image that the Church Fathers invoke, it is in the love of the father that all is resolved, as he embraces his wayward younger son and soothes the vexation of his older son. Here the extremes in images meet and are fused in the forgiveness of love.